In sailing vessels, the manner in which masts and sails are carried. The two basic types of rig are square and fore-and-aft. When combined, a vessel is said to be square-rigged. The two basic types can be subdivided into more specific vessels such as cutter, barque, and brig. Toward the end of the commercial sailing-ship era, the tendency was to do away with square sails in favor of fore-and-aft rigs because of the lower labor costs. The square sail, set on a transverse yard but without a boom to stiffen its lower edge, was probably still the commonest sailing rig, although it has been suggested that it was used in the manner of a fore-and-aft sail as much as for simply running before the wind. To suit wind conditions, sail area could be reduced by tying tucks in the canvas with reefing points, or increased by lacing on additional strips of canvas, later called bonnets. 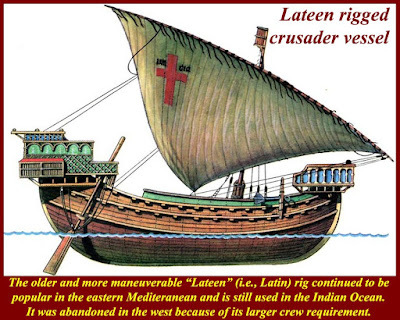 The triangular fore-and-aft lateen sail, familiar in the Mediterranean continuously from antiquity to the present day, was adopted in Europe for the carrack, the foremost trading vessel of the thirteenth and fourteenth centuries. This was square rigged on foremast and mainmast, with the lateen sail on the mizen (stern) mast, and with a cog hull. Quite suddenly, and by a chain of development which it has not yet been possible to trace fully, the three-masted square-rigged ship succeeded the carrack in the mid-fifteenth century. The additional masts and increased sail area made them more manoeuvrable than their single-masted predecessors and better able to sail to windward, square sterns provided improved accommodation, and they became progressively larger. They offered the technical conditions for oceanic voyages, and opened up the great age of discovery. The original form of the three-masted ship never changed fundamentally, although it was greatly modified over the course of time. It carried a fore- and mainmast set with square sails only, the fore usually slightly shorter than the main, and a much shorter mizen with one square sail (later more) and a fore-and-aft sail set aft of the mizen and later known as a spanker. Forward there was a bowsprit, inclined at about 30° and projecting beyond the stem, carrying headsails. Originally the headsails were square, set on a yard under the bowsprit and on a small mast rigged in a perilous-looking way at its end. Towards the end of the seventeenth century these were replaced by triangular fore-and-aft sails set on stays running from bowsprit to foremast, which did their work far more effectively; later, similar sails were set between the masts. Other improvements came with the increasing size of ships, and with the need to carry more sails for greater speed; individual sails became larger and increased from one or two to three or four on each mast by 1800. The masts themselves, becoming loftier and more square in proportion, soon outran the average tree and had to be assembled from two or three sections, one above the other; often, too, the largest sections had to be ‘made’ from smaller timbers. Sails were cut better and set more tautly to obtain the best from the wind: blocks, containing pulleys to increase manual capacity when hauling on ropes, appeared at an early stage, and multiple blocks with metal sheaves and bearing made running rigging easier to work. The earliest rams, which emerged in the mid-ninth century BC, transformed warfare on water from an encounter between armed men on vessels, to a battle between the vessels themselves for the ram made the ship that mounted it into the weapon, a guided missile no less. The earliest rams were pointed, logically enough, intended to make a hole in an enemy hull at or below the waterline and thereby cause it to become swamped and disabled. A matter to note is that although it is convenient to speak of ‘sinking’ ships by ram attack, insofar as our current general concept is of a holed ship plunging below the surface to the sea floor, this was not so for ancient warships. These ships were, of course, made entirely of wood, which has latent buoyancy. The heaviest item of the ship was the crew, who could be depended upon to get out of a stricken ship. That they did so is perhaps proved by exception in that there survive accounts of occasions when crews did not manage to escape, and which were notable enough to deserve special mention in the ancient sources. The ram itself was a metal covering mounted upon the forefoot of the ship hull, to protect it when it came into contact with a target. 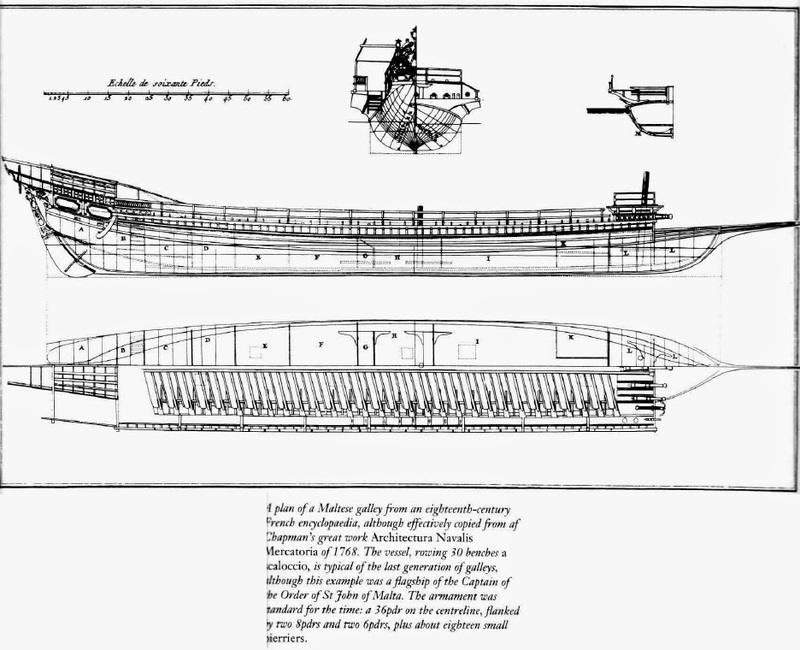 The fore structure of the ship itself was designed with timbers projecting forward to carry the ram and strengthened to withstand the impact and to transmit and spread the shock of ramming back along the hull. The integrity of the hull was further protected, at least by the time of the Athenian trireme, by closing the bow of the hull behind the structure that carried the ram, forming in effect, a bulkhead. The metal covering or casting which was the ram, if it had not twisted or fallen off as a result of damage, was of insufficient weight to drag the ship down and thus a ship holed at or below the waterline by a ram attack would ship water and settle to the level dictated by the buoyancy of the wood from which it was made. It was a perk of the victor in a naval battle to tow away wrecked (or ‘sunken’) enemy ships, to be beached and repaired. The wrecks of over a thousand merchant ships from the ancient world have been located to date, all sunk by the weight of their cargo, but not one seagoing warship has yet been found, with the exception of two Carthaginian ships found in mud off western Sicily, ironically loaded with cargoes of stone, which held them down. It was found that the early pointed rams had a tendency to become ensnared by the fibres of the edges of the timbers that they had pierced. This resulted in the attacker becoming trapped against its intended victim or in the ram being pulled off as the attacker tried to withdraw, leaving it probably as badly damaged as the victim. If it could not disengage, the attacker would in turn be assaulted by the crew of the stricken ship who had the ultimate motivation for a successful boarding counter-attack. The ram evolved, and by the sixth century BC had become blunted at the end. Greek pottery shows it shaped in the form of a boar’s head or a ram’s head. The purpose of this development was to push or stove in a section of enemy hull, rather than trying to make a hole, thereby disrupting the integrity of the hull and permit the ingress of water. As ships grew in size and required larger castings for their rams, these also developed further, presumably also as a result of experience in battle. By the early fifth century BC the face of the ram had developed horizontal vanes, on either side of a vertical central spine, designed to cut through the grain and joints of an enemy’s hull timbers. This form of ram, of which examples have been found, was a casting with a hollow socket at the rear shaped to fit over and be fixed to the waterline wales and stempost of the ship. 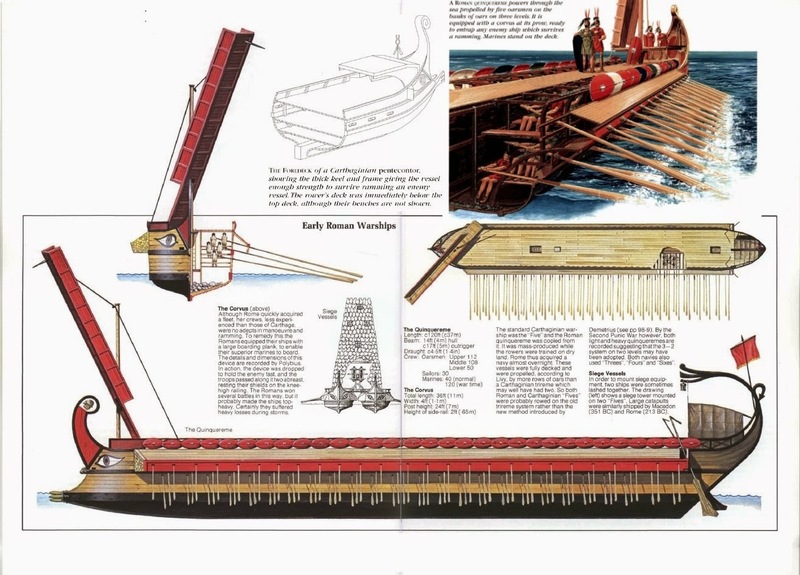 This was the weapon of the trireme age and obviously very effective. 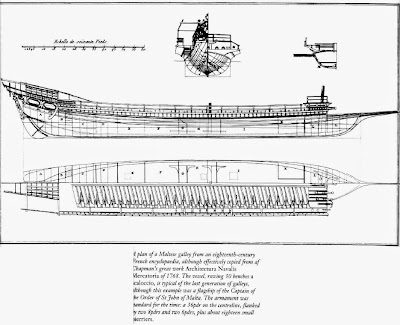 The form continued in use throughout the growth of the super warships of the ensuing Hellenistic period, which in turn needed increasingly large castings to fit those ships. As to the relative sizes of the rams fitted to warships, comparison can be made by comparing the size of their sockets; thus the ram fitted to the replica trireme Olympias had a socket 27.5 inches (700 mm) in width, while that of the Athlit ram, from a quadrireme, measured 33 inches (840 mm). Many rams from different sizes were taken from captured ships after the battle of Actium and mounted on Augustus’ victory monument at Nicopolis; the sockets there range in size from 40 inches (1,020 mm) to a massive 5 feet (1.51 m) in width, some of the mounting sockets being over 5 feet 6 inches (1.7 m) in height. The smallest of these is considered to be from a quinquereme, with the largest from a dekares or ‘ten’. With the elimination of other navies, the Imperial navy’s opponents changed from armoured hulls to the lightly constructed open ships of the barbarian raiders and the shape of their rams changed to deal with this different type of ship. By the early second century AD an upward curving, scythe-like ram had been developed, sheathed in metal but without the blunt, vaned end and intended to ride up and over an enemy bulwark and crush or submerge it, rather like an icebreaker breaking through ice. This form remained in service up to the end of the western empire and beyond. There is some evidence to suggest that a modified form was used by the northern fleets, being a short, possibly square in section, pointed ram. In the rougher northern waters, such a form could serve either to ride over and swamp or to pierce an enemy, doing damage at whatever point it struck. Even in the Mediterranean however, the sea conditions and/or violent battle manoeuvres could cause a ram attack to hit the side of an enemy anywhere from below the waterline, if heeled away, to as high as the thranite oarsmen. Fire weapons were, unsurprisingly, little used by ancient warships, which were made of wood with natural fibre cordage, their hulls payed with wax and pitch, in a Mediterranean summer they could hardly be more flammable. There is no record or evidence of cooking facilities aboard the ships, although small oil lamps were carried for navigation and signalling. In 190 BC a Rhodian squadron was trapped in a harbour near Ephesus by the Syrian fleet of Antiochus. The latter landed a strong force of troops behind the harbour, forcing the Rhodians to man their ships and attempt a break-out from the harbour. The superior enemy fleet was waiting to pick them off piecemeal as they emerged from the narrow harbour mouth and although twenty ships were lost or captured, seven or more hung flaming braziers from long booms on either side of their bows, ready to drop them on to any enemy ship that ventured too close; they dared not and those ships so equipped escaped. It seems that the Romans and Rhodians had experimented with the braziers during the preceding winter but decided that the risks outweighed the benefit and their use by the Rhodians in this instance was driven by desperation. There is a first-century BC graffito at Alexandria of a ship with such a brazier rigged outboard on a boom, but this may well be a navigation light or improvised beacon, held well away from the ship. As to the use of flaming projectiles, although fire arrows had long been used on land, the first indication of their use at sea was in 42 BC during the civil wars. A troop convoy, escorted by some triremes, had been caught crossing the Adriatic, on its way to join Octavian and Antonius. The wind failed and the transports tied themselves together to form a stable fighting platform for the troops. Their opponents simply stood off and shot fire arrows, burning many of the ships, the remainder cutting themselves free and surrendering. The next occasion (that we know of) when fire arrows were used was at Actium. Seeking a conclusion of the, thus far, evenly matched battle, Octavian sent ashore for burning material; this his men used in fire arrows or tied to javelins and even brought their ships close enough to throw lighted torches at their enemy. At longer range, they used artillery to hurl pots of blazing charcoal and pitch. The fires caused on Antonius’ ships were contained until the wind strengthened and many of his ships were consumed by fire. It remains notable that there were no fire weapons aboard the ships and that Octavian had to specifically order them brought from his encampment ashore. By the late Empire, Vegetius warns of the danger of ‘arrows wrapped in burning oil, tow, sulphur and bitumen’ and shot from catapults; however, there are no accounts of the use of such weapons in the reported battles other than at Actium, nor does Vegetius say that theses missiles were carried aboard ships, rather than shot from the shore. The other way that fire was used as a weapon afloat was by the use of fireships, recorded as used by the Syracusans against the besieging Athenian fleet in 413 BC: ‘seeking to burn the remainder of the fleet, they loaded an old merchant vessel with faggots and brands, lighted them and let the ship go, the wind was blowing right on the Athenians.’ This defines the use of a fireship, although in this instance, the intended victims managed to push it clear. The Romans made use of this tactic in their civil wars and in 48 BC, an admiral of Pompeius’, having brought with his fleet ships filled with pitch, pine resin and other flammable materials and having a favourable wind, launched them against a Caesarian fleet laying in Messina. The attack succeeded, all thirty-five ships of Caesar’s fleet being burned to the waterline. A second attack by forty fireships against another Caesarian squadron, more alert than the former, burned five ships, but Pompeius’ fleet was itself routed by the counter-attack. Finally, in the last operation by a joint western and eastern fleet against Vandal-held Carthage in AD 457, their closely packed fleet and transports were held against the shore by an onshore wind. Taking advantage of those ideal conditions, the Vandal fleet launched a fireship attack, following it with a ram attack and destroyed half of the Roman fleet. The earliest surviving account of the mounting of a tower on a ship was by the Athenians, who built one on a merchant hull to assist in their siege of Syracuse in 413 BC. Alexander the Great did the same for his siege of Tyre in 332 BC, as did Marcellus for his assault on Syracuse in 214 BC. In all of these cases, the ships were taken, rowed or towed, to their desired station and not intended to otherwise move. At the beginning of the First Punic War, the Romans devised a lighter form of tower with a timber frame, covered by canvas and which they mounted on the decks of their larger warships. Quadriremes were the smallest types to be so equipped; towers could be mounted forward, aft or amidships and even in pairs, one fore and one aft, on the biggest ships. It may be that towers were also mounted on the very largest of ships, athwartships in pairs, jettied out beyond the hull on each side. The evidence for this, in the absence of extant illustrations, is in Polybius’ account of the battle of Chios in 201 BC between the fleets of Philip V of Macedon and Rome’s allies, Pergamum and Rhodes. At one stage in this great battle, the ship of the Pergamene admiral Dionysodorus, a quinquereme, attacked a Macedonian ‘seven’, missed and brushed along the side of his intended victim. The latter had quickly withdrawn their oars but Dionysodorus’ ship was not quick enough and had its starboard oars sheared off and also ‘had the timbers supporting his towers smashed to pieces…’ This was of course impossible for towers mounted amidships. Up to six archers, slingers or javelinmen could be accommodated on each tower, able to shoot down on to an enemy deck. The towers, as a permanent feature, were heavy enough and added to top weight, wind drag and thus instability to the ship, and undoubtedly contributed to the loss of so many ships in storms. They nevertheless continued in use until the thirties BC, when a new type was introduced by Agrippa. This was of lighter construction, collapsible and able to be stowed flat on deck when not in use, to reduce top weight. The canvas coverings were often painted a distinguishing colour on all the ships of a squadron to aid in identification; by the later civil war period, they were sometimes painted to resemble masonry.